Croft Circuit has announced initial details of the mouth-watering line-up of on- and off-track entertainment during its much anticipated two-day historic motor sport ‘Nostalgia Weekend’ taking place in just over five weeks’ time (6-7 August). The retro extravaganza – the only one of its kind in the North East region and which invites public to dress in period style (1940s-1970s) – received widespread acclaim during its inaugural event in 2010. Twelve months on, the North Yorkshire venue near Darlington is preparing to turn back the clock for a second time and another highly charismatic trip down memory lane… Tickets for adults are available at special advance rates priced just £10 (Sat) or £12 (Sun) by visiting www.croftcircuit.co.uk or calling the circuit office on 01325 721815. Admission for accompanied children aged 15 and under is FREE all weekend. On track, highly evocative sights and sounds are guaranteed with no fewer than 18 races being organised by the renowned Historic Sport Car Club for a potentially staggering entry of some 200 saloon, GT, single-seater and sportscar categories from the Forties right through to the Eighties. Many of the cars set to appear during Nostalgia Weekend were raced in their heyday by some of the sport’s top names including the likes of Ian Ashley. He was on the Formula 1 grid against the likes of James Hunt during the mid-Seventies and is set to appear at this year’s Nostalgia having contested the event 12 months ago. But while there will be plenty of circuit action for aficionados of the sport to salivate over, off track there will be just as much entertainment – if not more – to turn the two-day festival into just as much a social occasion and thereby keep the visiting public fully entertained. For example, more than 300 classic cars have already been pledged as part of a huge static show that will also feature numerous motorcycles and other rare automobilia, again from the Forties right through to the Seventies. Also confirmed, thanks to the highly enthusiastic Croft Military organisation ( www.croftmilitary.co.uk), and adding a real wow factor in the skies above will be a Battle of Britain Memorial fly-past from a WWII Spitfire and Hurricane (Saturday) as well as an aerial display from a late Fifties Jet Provost (Sunday). Carrying on the heavy WWII military theme that symbolises much of the weekend, a vast collection of wartime vehicles including jeeps, tanks (including a 19-ton Chaffee), motorcycles, weapons carriers and even an ice cream tricycle(!) is being assembled for viewing as well. Adding further to the atmosphere and charm will be a Forties fashion show, music including a George Formby tribute, 'living history' WWII encampments and Army Kitchen serving up food from the period, plus public rides around the Croft race circuit on the Sunday morning in a vintage open top bus. “We are delighted to welcome back the HSCC and its wonderful historic race categories and also the many owners of the incredible array of machinery they will be bringing along. After what was achieved in 2010, it’s little wonder we’ve had enquiries about our 2011 Nostalgia Weekend from all four corners of the UK with some people prepared to drive some incredible distances to be with us at the event,” commented Tracey Morley, Croft Circuit Manager. “The summer is certainly the season for the big classic and historic motor sport and automotive events – July alone will witness two of the biggest with the Goodwood Festival of Speed and Silverstone Classic. But while these are long established, our Nostalgia Weekend is very much in its formative stages yet already growing rapidly thanks to its professional organisation and unique appeal for people across the region. “Nostalgia Weekend of course follows two more ‘blue riband’ events for Croft, the British Superbike and British Touring Car championships, and shows again we really are capable of hosting the very best in UK motor sport here in the North East." 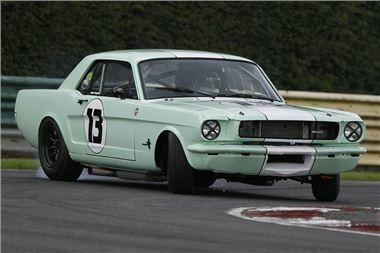 Picture above shows a Ford Mustang in spectacular sideways action during Croft's Nostalgia Weekend event in 2010. Fans can further keep in touch with what’s happening at Croft Circuit online via Facebook (look up CroftCircuit), Twitter www.twitter.com/croftsupporters and even ‘own’ a little bit of the circuit by joining the Supporters Club. See www.croftsupportersclub.com or email enquiries@croftsupportersclub.com for more details.